House Majority Whip Steve Scalise (R-LA) explained his firm pro-Second Amendment stance to ‘View’ host Whoopi Goldberg Tuesday. Scalise said that he’s gotten that question a lot since the incident and his views didn’t change because they are rooted in the nation’s founding principles. “Three and a half months later I came back to Congress and got to get back to work again and I had people that would ask me ‘you know so are your views different on gun control,’” he said. “I’ve got deep-rooted conservative beliefs but they’re rooted in what the fundamental foundation of this country is based on,” he emphasized. He pointed out how important the right to self-defense was to the founding fathers. 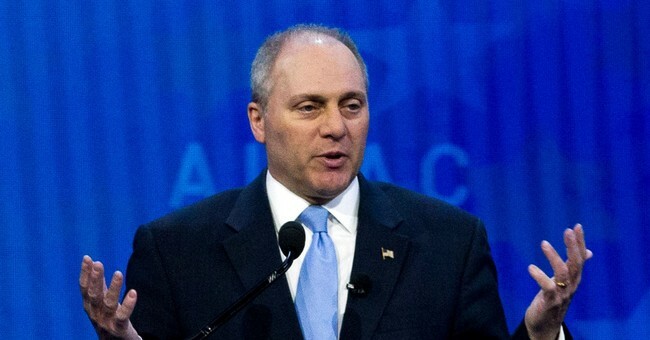 Scalise added that it was important to enforce the law properly. He praised the passage of bipartisan laws that are aimed at addressing people with mental health issues and their access to guns. Later in their discussion, Goldberg argued that the founding fathers “did say militia” in the Second Amendment. Scalise responded by citing the Supreme Court’s decision in District of Columbia v. Heller.